Build your confidence and skills at this high-energy summer music camp! You'll love the motivation of working with other passionate students. Students entering grades 10-12 in the fall can earn service hours. Summer Jazz Ambassadors is the flagship Seattle JazzED summer camp. As part of a multi-age ensemble you will learn NEW repertoire drawing on less explored genres like Funk, Salsa, Afro-Beat and more. This camp is intentionally designed to foster confidence in all students, encourage creative risk-taking and most of all, have fun! If you're entering grades 10-12 in the the fall you can participate as a Leader-in-Training. Leaders-in-Training earn 30 service hours. Scroll down for job description, schedule and application link. In the first week of this unique summer camp you’ll develop your improvisation skills, sectional leadership and musical knowledge and technique by playing music from a broad base of genres: Funk, Fusion, Soul, Salsa, Samba, Afro-Beat, Reggae and more. In the second week, you'll work on honing personal and ensemble presentation skills. This includes public speaking and presentation preparation for a final concert at the Royal Room. You’ll gain valuable experience by sharing your music, your instrument and your unique perspective as an ambassador for music. You will have the option of entering a sliding scale tuition code on the registration check-out page. Be sure to select the payment plan option if you want to break your payments up. Please note you will also have the option of paying your chosen amount in full if you prefer. If you'd like to pay a DIFFERENT sliding scale amount than the options here OR get a FULL TUITION WAIVER (no questions asked), fill out our easy online form, and we'll send you a custom tuition code. Open to student musicians in grades 6-12, any instrument. Non-traditional jazz instruments such as French horn, bassoon, violin, viola, cello, etc. are welcome. We strive to create an intentional mix of ages and abilities in this summer camp so that younger students are challenged and older students strengthen their leadership skills. 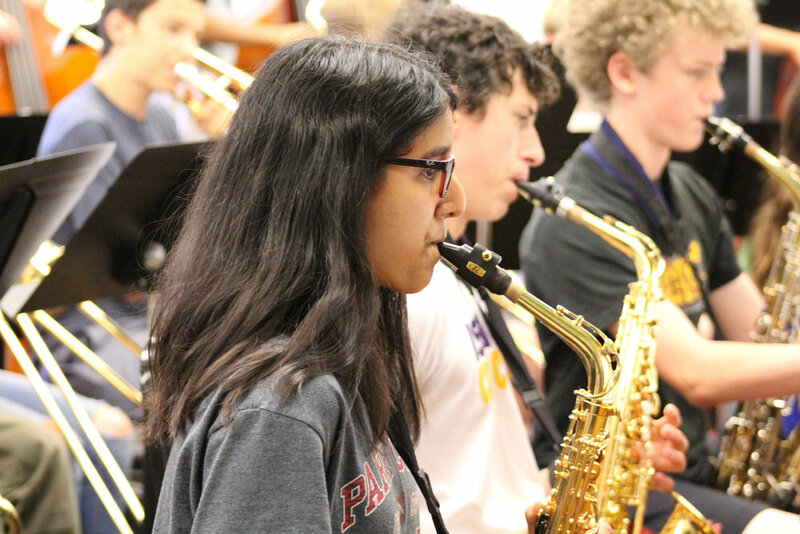 We have limits on how many students we can accept on each instrument in order to keep the ensemble balanced. For example, once we have the maximum number of trumpets signed up for a session, we will create a wait list for that instrument. Click here to register online. You can enter your chosen sliding scale tuition code (listed above) on the final check-out page. You should receive a confirmation email from our registration system Active.com. Open to students going into grades 10-12. Leader-in-Training duties include leading sectionals, curriculum support and serving as mentors to younger students. You will be assigned at least two younger students as their ‘LIT buddy’ and you will take extra care to make them feel included and supported at camp, for example eating lunch with your buddy group or helping them work on parts of the music. Please note, LITs stay until 2:00 PM each day. LITs receive 30 community service hours for graduation requirements and a letter of recommendation for their respective college/job applications. To enroll as a Leader-in-Training, please register as normal and then complete the LIT form below. Your registration as an LIT will not be considered complete until we have your LIT form, which is due by June 30th. LITs must be entering grades 10-12 in fall 2019. Ricardo Luna is a music educator with over 15 years of experience working with students at all grade levels. With a firm belief that music can have a positive impact on students, he strives to provide our youth with access to quality music education. In addition to his administrative role at Seattle JazzED as Student Youth Development Director, Ricardo oversees and teaches our introductory Jazz Prep classes, the Benny Goodman Ensemble, and the Summer Jazz Prep Camp. Originally from Los Angeles, Ricardo moved to Seattle three years ago with his wife. He continues his own musical journey playing trombone, acoustic bass, and arranging music. Freddy Gonzalez is a trombonist, composer, and music educator from New York City. Currently living in Seattle, WA, he was introduced to the Pacific Northwest in 2017 after an apprenticeship with television composer Ron Jones (“Family Guy,” “Star Trek: The Next Generation,” and “DuckTales”).